Our Earth Science Hall features a microscope lab with both self-serve and teaching components. Our teaching collection includes 8 research grade microscopes and is used to study sand samples from around the world. Classes in the Microscope lab are available during field trips for an additional fee. Open to all patrons and field trip students is our self-serve microscope bar that contains simple microscopes. Explore one of the samples we have on site or bring your own “discovery” from home. 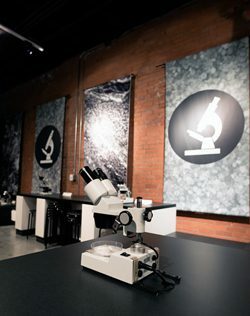 Be sure to keep an eye on the website for details about live demonstrations and events in the lab. You’ll gain a whole new appreciation for the wonders of sand and the world around you!